BATTLE CREEK, Mich., 2017 ― Leading global automotive supplier DENSO has renewed its commitment to support and provide educational opportunities for the communities it serves in West Michigan. DENSO Manufacturing Michigan (DMMI) in Battle Creek, the city’s largest employer and one of the top automotive thermal systems and component producers, today awarded scholarships to four outstanding students through partnerships with the Battle Creek Community Foundation (BCCF) and the Battle Creek Area Math and Science Center (BCAMSC). Scholarship resources come from the DMMI Scholarship Fund, which DENSO established in 1997 to assist children of employees with the rising cost of higher education. The 2017 BCCF scholarship recipients are Jayson Butler and Calder Lachance of Lakeview High School and Ian Mullis of Saint Philip Catholic Central High School. 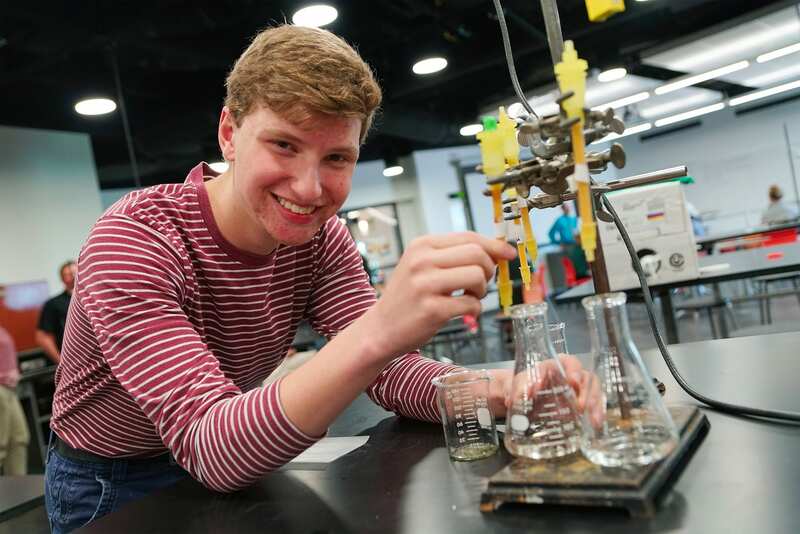 Butler plans to attend Michigan State University and major in chemistry this fall. Lachance will study political science at the University of Michigan and Mullis will begin engineering studies at Kellogg Community College. A selection committee from the BCCF chooses winners based on student activities and work experience. The BCAMSC scholarship promotes math and science education and excellence, recognizing outstanding graduates with financial assistance for college expenses. Staff at the BCAMSC selects two outstanding students for the scholarship each year. Lachance and Ana Singh, also of Lakeview High School, received this year’s scholarships. Singh will attend Calvin College to study biology and Spanish. DENSO Manufacturing Michigan, Inc. (DMMI) is the lead production facility for DENSO’s Thermal Systems North American Center (TAC), manufacturing automotive air conditioning and engine cooling components and systems, including condensers, radiators, CRFMs (condenser, radiator, and fan modules), heater cores, evaporators and HVAC units. Founded in 1986 as DENSO’s first manufacturing facility in the United States, the DMMI campus in Battle Creek includes more than 1,380,000 square feet of manufacturing, warehouse and administrative floor space in 6 buildings on over 100 acres of land. DMMI is the largest employer in Battle Creek. DENSO is a leading global automotive supplier of advanced technology, systems and components in the areas of thermal, powertrain control, electronics and information and safety. With its North American headquarters located in Southfield, Michigan, DENSO employs more than 23,000 people at 30 consolidated companies and affiliates across the North American region. Of these, 28 are manufacturing facilities located in the United States, Canada and Mexico. In the United States alone, DENSO employs more than 15,000 people in Alabama, Arkansas, California, Iowa, Georgia, Kentucky, Michigan, North Carolina, Ohio, Pennsylvania, South Carolina, Tennessee and Texas. DENSO’s North American consolidated sales totaled US$9.9 billion for the fiscal year ending March 31, 2017. For more information, go to www.denso.com/us-ca/en. Connect with DENSO on Facebook at www.facebook.com/DENSOinNorthAmerica.